A fun basketball game with a twist. Rent this inflatable game for your next event and watch the excitement. A two player game, head to head competition where participants try to throw their 5 basketballs through the basketball hoop one at a time. Two sets of colored basketballs are provided. Once the ball goes through the hoop, it returns to the opposite side. The object is to get all of your balls onto the side before the other player gets their balls on your side. Whoever completes the task first wins! 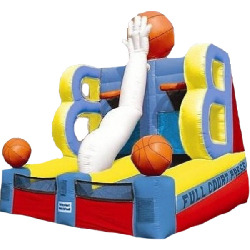 This Inflatable offers a new and exciting twist in basketball shooting competition. Two players attempt to place all of their colored balls in their opponent's ball trough.